So, how are we learning Malayalam? As I said many times before, Liya has begun to learn Malayalam alphabets. Though she speaks a "not so bad" Malayalam, English is still her primary language and sometimes I feel ashamed that she is not so a big fan of her mother tongue. How we benefited from breastfeeding? I received a personal message from a reader, a mom of 3 months old baby, inquiring how we benefitted from exclusive 6 months breastfeeding- my personal experience. Well, it's been more than 2 years since I quit nursing. Hence, this email dragged me back to those first 6 months of mommyhood. I have nursed L for two years, out of it 6 initial months were exclusive nursing time (no water, no finger food etc). With no second thought, I would say it was 100% beneficial for us. My older post on nursing is available here. This week, we are going to review The Three Billy Goats Gruff (Read it Yourself Level - 1). Like I said earlier, L began reading on her own and so we have been concentrating on Level 1 books which will motivate and help her nurture early reading skills. ... put it in your own way and do it. At the end what matters is the effort and sometimes the result too! She said: "I will do homework with cherries." Here is our "cherry flavored weekend homework! I have been MIA for quite sometime now. We went homeland for Christmas holidays. We had yet another wonderful road trip. This time, we chose a different way, via Nadukani which is in the western ghats, and so we passed through Bandipur Tiger reserve. Liya had awesome time seeing animals walking in the road side. We were in the forest around 4.00 pm and many animals were roaming around. The first one we met on the road was an elephant. He was pretty old and unusually alone. Usually you see elephants in the forest area traveling in groups. We also got to see numerous deers in action. Inspired by Foz, I thought it's a good idea to share a new recipe we tried at home this week. We had an awesome road trip to Kerala and on the way back we piled up our car with lots of fruits and veggies bought from local farmers. We had bought 2 KGs of country tomatoes for just Rs. 10. Two kilos of tomatoes were too huge for a small family like us and that's why I gave a try with some homemade ketchups. This project, though I had joined last year, had to quit in less than 2 weeks, lol. However, this time I am determined to take it through the year (In sha Allah!). 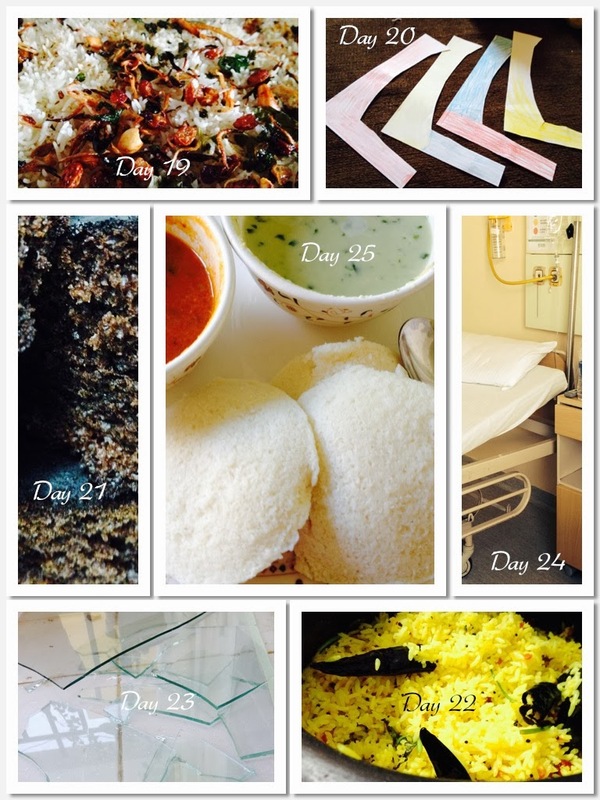 This is basically about taking a random pic everyday through the year and sharing it on the blog. To make it easier this year, I am planning to share the photos every week as a collage. (In Sha Allah- If God wills). Wish me luck!